The Pacfic Northwest Coast Teddy Bear is sitting on this hand loomed knit baby blanket just waiting to hug your special baby. 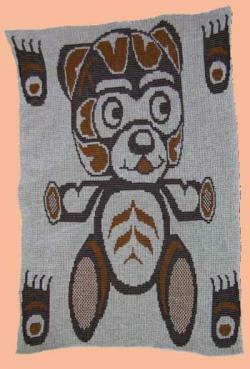 The Teddy Bear Design is filled with shapes used in the Pacific Northwest Art Style. These are harder to depict in a knitwear design where the sutle curves and definite lines must fit in smaller spaces with rectangular shaped knit stitches. Common features which are shown is brown formline with Inner designs composed of ovoids, U forms and S forms and several combinations of ovoids. The bear paw with claws are found in the 4 corners of the baby blanket. This is the feature that can be found in the co-ordinating baby cap and baby booties found in the baby sets show room. Colors: Ivory with Brown form line and Desert art forms.